If you are entertaining a crowd or simply looking to impress a dinner guest, this is a beautiful dish with loads of colors and simple elegant flavors. 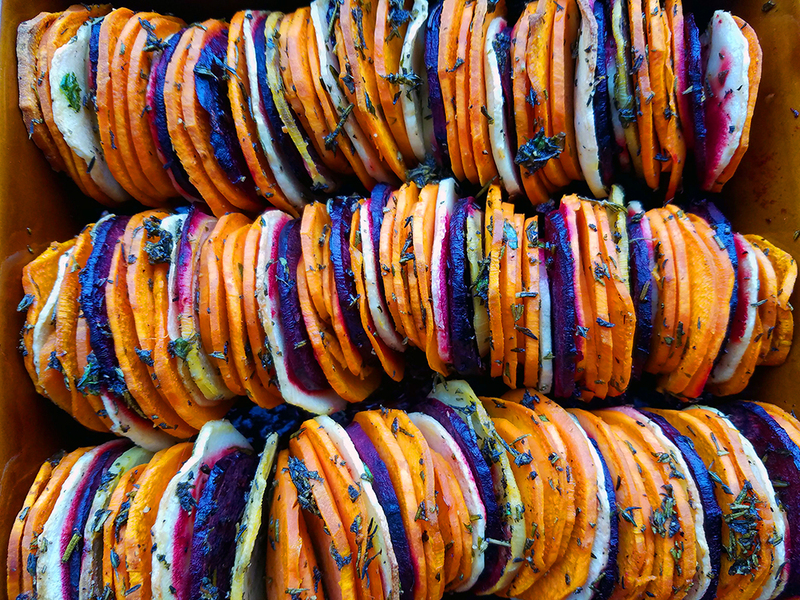 I personally enjoy this dish in the late fall, early winter, when root vegetables are at their finest. And this makes a wonderful alternative to your traditional marshmallow, sugar loaded sweet potato casserole we all see around Thanksgiving tables. Traditionally, Hasselback stems from the Swedish "Hasselbackspotatis" or Potato à la Hasselbacken which is a potato dish. Hasselback is where the potatoes are cut very thin, about halfway through, into slices and assembled facing up. Usually topped with butter, breadcrumbs and almonds. 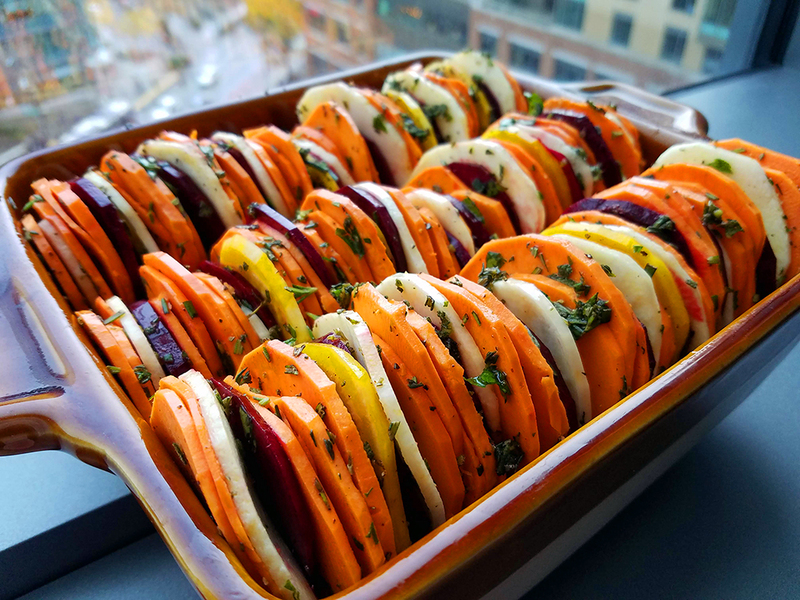 I have seen some pretty awesome looking Hasselback variations from Hasselback Butternut Squash to Sweet Potatoes topped with mexican flavors. This dish is definitely a Thanksgiving time variation. To prepare your vegetables, you can use a sharp knife or a mandoline cooking tool which has a sharp blade and a flat surface, where you can easily slide the vegetables over and quickly make uniform slices. I used a mandolin for mine, but occasionally had to use a knife to get the last bits cut (to save my fingers!). 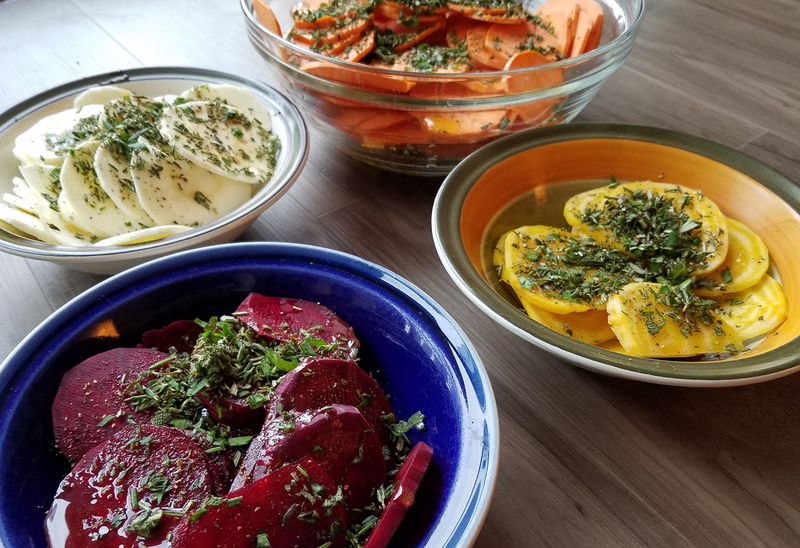 You'll also want to keep in mind when prepping your vegetables for this, that you will want to keep your vegetables separated until you are ready to assemble. 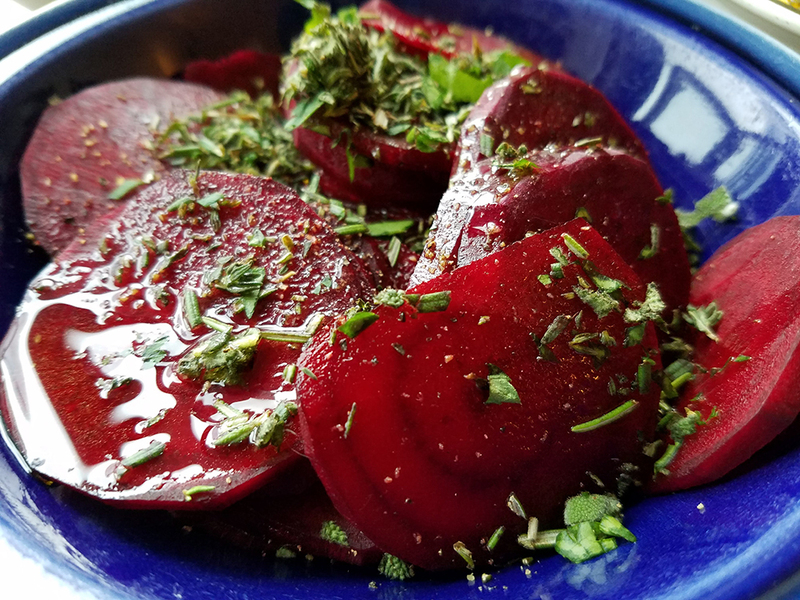 This is especially important with the red beets, as the color will bleed onto other vegetables if you were to mix them together. They may also stain your hands and/or work surface so keep this in mind when prepping red beets. Using small bowls to place your vegetables into can make a big difference in keeping things separated and bleeding of colors to a minimum. I am using organic ingredients. You'll also want to get your vegetables at similar diameters, aim for about 1-1/2". Wash and peel the parsnips, beets and sweet potatoes. Slice into very thin circles using a mandolin or a sharp knife, about 1/8" inch. Chop your fresh herbs finely, set aside. Place each sliced vegetable into its own bowl. Sprinkle with lemon juice, olive oil, black pepper, and fresh herbs. Using your hands to toss and coat well (start with the parsnips, sweet potato, golden beets then red beets to avoid bleeding colors). Arrange the vegetables in a square baking dish in three rows, packing them tightly enough they won't fall oven but not too tight that air can't circulate. Top with any remaining herbs and olive left in your bowls. Cover with foil and bake for 15 minutes. Remove the foil and continue baking till fork tender, about 30 - 40 minutes.